"At a time in my life when I needed someone to guide and support me, Chris was there. I can't thank him enough." Every man like Steve needs a Prostate Cancer Specialist Nurse like Chris. Sadly, 2 in 3 men diagnosed with prostate cancer are missing out on this life-changing expert nursing support. The funds you raise this Dry July will support more men like Steve during the most frightening time of their lives. As a frontline police officer for 28 years, Steve Lindsey bravely puts his life on the line on a daily basis, but he openly admits the most frightening moment of his life happened in the doctor’s office, being told … “You have prostate cancer”. After receiving his diagnosis Steve felt completely overwhelmed. 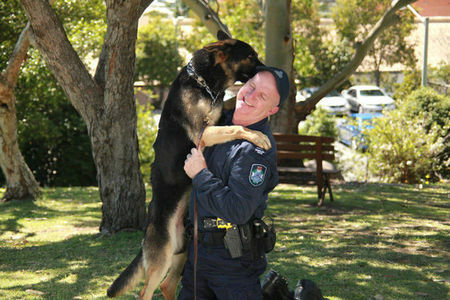 Steve is back on full duty with his new police dog Leo. There are two days that he will never forget on his cancer journey - the day he received his prostate cancer diagnosis and the day he met his Prostate Cancer Specialist Nurse Chris.